Today we are two. No, I didn't run off and get myself hitched over the weekend; I continue to live in sin. 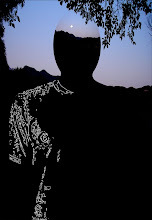 I mean it's the Omegaword blog's second birthday. Like most two-year-olds, the blog has seen a few changes, and also exhibits the curious mix of faux maturity and belligerence that so often characterize life's second year. Although the number is unremarkable by any modern measure, some 4,200 thrill-seekers have visited these virtual pages since I began keeping track of such things. Most of you check in from the United States—76% to be exact—but I feel a particular thrill when I see other parts of the world pop up on the radar. The United Kingdom comes in second, followed by Canada, then Australia only a percentage point behind. 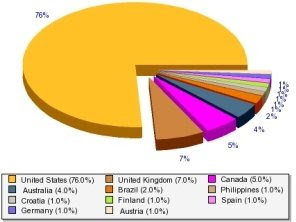 Brazil, the Philippines, Croatia, Finland, Spain, Germany and Austria are responsible for those remaining slices of the pie. Thanks for dropping by, folks. For the 4,800 page-views recorded during the same period, 54% have been by way of Internet Explorer 7, and Firefox is in second place with 16% of the share. 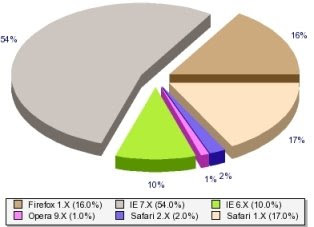 The older 6-point-something versions of Internet Explorer are still used by 10% of viewers, with the Opera and Safari browsers making up the balance. For reasons that remain unclear to me, the December, 2006 archive still generates more interest than any other collection on this blog. It's possible I was more entertaining then, but I'm only guessing. The hairy eyeball monologue and my speech-recorder evaluation are tied for the popularity slot directly below that. It's a veritable demolition derby after that, although the notes from the edge category continues to appeal to many. This may be more than mere coincidence, since so many posts in that group are of questionable judgment and taste. Extended cranial meltdown aside, and assuming this creative-writing exercise isn't ruined by e-kitsch and capitalistic vulgarity, I hope to use these pages to explore new ways of communicating the ideas and ideals that guide and confound my daily journey. You can ride along if you'd like.